Peach Wine & Peach Melomel! While I drink more beer than wine, I can never resist an opportunity to make fruit wine. I especially love the middle-to-end of summer here in Colorado when Palisade peaches become available for purchase. This year we purchased 36 pounds of Palisade peaches through the local chapter of the Rotary club as part of a fundraiser. They were nice enough to deliver the peaches, after which Melissa added this video to our Facebook page. So just what did we do with 36 pounds of peaches? We ate some, of course, but we also made peach wine and peach melomel. For the peach wine, we found a good recipe in a fruit wine book. The goal was to create a nice wine base to dry out completely then sweeten as needed to bring back some peach flavor. I like this method for its simplicity. Lots of peach wine recipes call for using White Labs WLP720 or Wyeast 3463 Forbidden Fruit yeast to allow the wine to finish sweet, but I can't drink it that way. I'd rather dry it out completely using a fresh fruit yeast (Lalvin K1-V1116) with staggered nutrient additions, then sweeten just a touch. The SNA method ensures vigorous fermentation while retaining the natural fruit aroma and flavors, and the regular stirring and degassing seems to limit the H2S production that can happen with the K1-V1116 at temps above 16C while helping to ensure the pH doesn't drop low enough to inhibit fermentation/flocculation. **We added one tsp at a time and stirred, then took readings using our digital pH meter with ATC and stopped at the target pH. It came out to about 4.5 tsp acid blend that we actually used - the recipe may have been expecting overripe peaches or number 2s. Pit all peaches and cut away any bad spots. Drop into fruit crusher and mill (or place in bucket and mash as well as possible). As we were just about to start processing, our friends Jennifer and Curtis showed up and jumped in to help. Thanks to Jennifer for taking some photos to document! 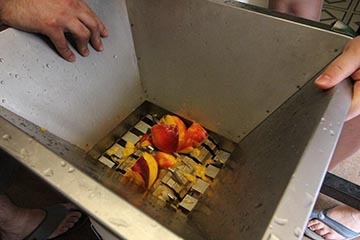 We decided rather than fermenting crushed fruit we would first press the peaches, then place the pressed pulp in a nylon bag to make removal easy at first racking. Take note we placed the crushed peaches in a nylon bag before pressing because we wanted to make pulp removal easy post-fermentation. The total yield was a little less than one gallon of juice when all was said and done. This amount made sense since the recipe called for 17.5 qts of water. We mixed the table sugar and peach juice with enough water to reach a little over 5 gallons, then adjusted the pH with acid blend. We mixed in crushed KMS campden tabs and pectic enzyme and allowed the potassium metabisulfite to bond to the must and pulp for 12 hours before pitching the re-hydrated yeast with Go-Ferm Protect. The must measured 23 Brix. For the first week of fermentation we stirred daily, punching the pulp into the must to degas. We added 6 grams of Fermaid O and 5 grams DAP (Diammonium Phosphate) two days after pitching the yeast. After 16 days we removed the pulp and allowed it to drain into the wine, then racked into a 6-gallon carboy. After another 2-4 weeks we'll rack, degas, stabilize and fine with chitosan and keiselsol. We'll rack one more time, fine with bentonite if necessary, then sweeten and bottle! 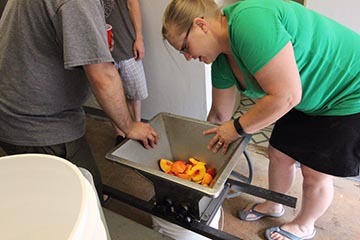 Rather than press the peaches, we decided to simply crush, place in a nylon bag, and ferment as-is to see if pressing was really necessary (more on this later). Because honey is naturally antiseptic, I see no need to use potassium metabisulfite. Omitting this anti-oxidant does cause some minor browning. 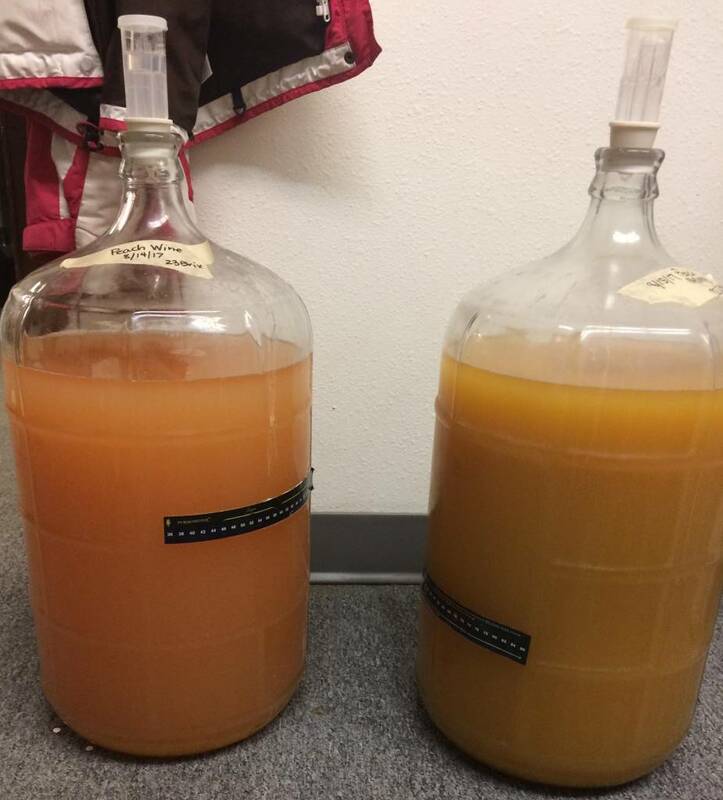 The photo at the top of the blog post is a side-by-side of the wine and the melomel at first racking, and you can see the wine retained a nice peach color with slight pink from the skins. The melomel browned slightly and has a ruddier color. 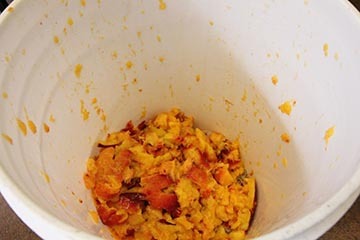 We mixed the honey with filtered room-temp water until it dissolved, then added the nylon bag with crushed peaches and any leftover juice from the bucket and topped off to just over 5 gallons (it started at 22.2 Brix). I pitched the re-hydrated yeast/Go-Ferm Protect slurry on the same day. I am a huge fan of the SNA (Staggered Nutrient Additions) method for making mead, and it was employed here using 6 grams Fermaid O on days 2, 4, 6, and 8 as well as regular degassing through day 10. If you're unfamiliar with SNA there's a great primer on it here. When racking the melomel on day 15, I noticed it was a lot less clear than the wine. I am assuming the exclusion of pectic enzyme is a contributing factor here. If we make this recipe again I'll be sure to include it. 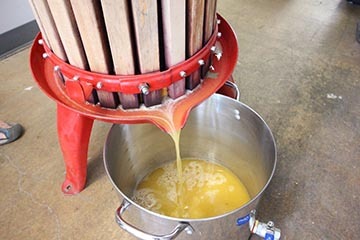 Draining and squeezing the peach pulp to press out as much wine as possible was a lot more work for the melomel than it was for the peach wine. I estimate it took at least 30 minutes whereas the pulp from the wine required less squeezing and was drained/re-pressed within 5 minutes. 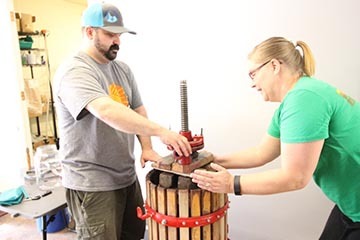 I'm not sure there was any real time savings when factoring in the setup and cleaning of the fruit press, but I think the value may have been in how much time the fermented wine was exposed to the ambient environment. I added 1/4 tsp potassium metabisulfite at racking to prevent further browning of the melomel. We'll treat it much the same way as the wine from here with rackings, fining and bottling. I do not plan on sweetening it at all, but that may change depending on how strong the peach flavor carries through to the finished wine. I'll post an update on these projects in the future! Don't Look Down Your Nose at My American Lager!